Hoversurf, a startup from Russia’s Silicon Valley (the Skolkovo Innovation Centre), has designed and built the world’s first flying bike. The Hoverbike S3 is able to reach a maximum speed of 96 km/h and can be used for half an hour without recharging, though at the moment much depends on the driver’s weight. For now, it is only possible to buy a flying bike in countries where a pilot's license is not required to drive it. You also need to shell out around $150,000 and complete a mandatory piloting course in California. In Dubai, the police have already bought a Russian flying bike to use it as a patrol vehicle in very busy areas. Sputnik has spoken to Denis Saitgareev, Hoversurf's chief designer, to learn about the company's development plans. Sputnik: Where did the idea of a Hoverbike come from? Denis Saitgareev: It came from Alexander Atamanov, the founder of the company. He wanted to create this flying bike and realise the idea of being able to fly. We started first with a twin screw bike and then moved on to the current quadruple-screw scheme. The first experimental version of the bike is now in our laboratory; this is the model that we created the Hoverbike on. We didn't know how interesting this idea would be. But when we presented the project, it aroused strong interest; and only then did full-scale development of the bike began. Sputnik: How many prototypes did you make? Denis Saitgareev: We made about four prototypes; the last one is made of carbon fibre, we presented it in Dubai. Denis Saitgareev: Yes, right. I don't know what the precise conditions will be but we have concluded a contract for the delivery of these bikes; they'll probably be used for patrolling the streets. Sputnik: What is the bike's energy storage capacity? How long can it work on a single charge? Denis Saitgareev: Much depends on a pilot's weight — with a person the bike can fly for 15-20 minutes, but without a pilot, it can fly for half an hour. The maximum height is 15 metres, but in Dubai, we have reached 30 metres. But you don't need to fly that high in populated areas; a height of 5-15 metres is enough. Sputnik: Can it be used as a drone? Denis Saitgareev: Yes, it is possible. You can fly it using sensors and a GPS system; this way the bike will have a ref trajectory. We plan to make a cargo-carrying bike in the future. In some ways, the bike is similar to a drone, but it has different engines and a different computer. From a technical point of view, it's a more complex mechanism. Sputnik: What are your development plans? Denis Saitgareev: We plan to launch mass production of the bike. The company's main task is developing certain technologies and patenting them. 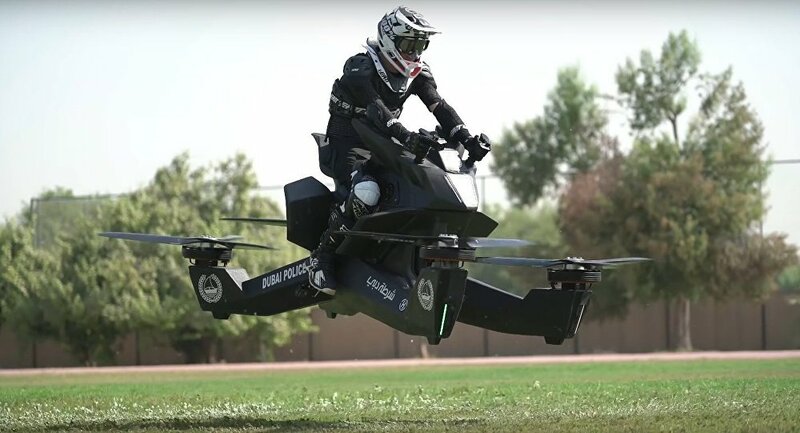 As soon as we have all the patents to create a bike, we'll start negotiating outsourced production; at present, there already are some companies that have shown an interest in producing the Hoverbike, such as Honda and Yamaha from Japan. Sputnik: Why is it that before buying the Hoverbike one has to complete a course in California and not in Russia? Denis Saitgareev: We have a team in San Francisco, California; we test our bikes there. Our bike falls into the weight class of up to 150 kg, and in the US it's enough to just get a flight license. Besides, we have a showroom where we show and sell our bike there.